As planetesimals drift toward their star, they should clear out a path from the gas they move through. Some of that gas helps the planet to grow. When NASA announced the discovery of over 1,200 new potential planets spotted by the Kepler Space Telescope, almost a quarter of them were thought to be Super-Earths. Now, new research suggests that these massive rocky planets may be the result of the failed creation of Jupiter-sized gas giants. Most astronomers currently believe planets are created by a method known as core accretion. Giant disks of gas circle newborn stars. Grains in these disks bond together to form larger objects known as planetesimals, which collide, creating larger and larger clumps of material. When the clumps reach a critical mass, their gravity pulls in gas from the disk around them. In tidal downsizing, a gas disk first forms massive gas clumps farther out in space than where most of the planets discovered so far reside in their solar systems. Left to their own devices, these clumps would cool and contract into very massive (~10 Jupiter mass) planets. 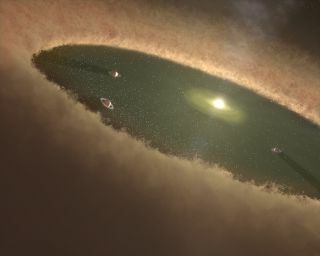 Nayakshin showed that during this contraction dust grains grow to large sizes and then fall to the center of the gas clump, forming a massive solid core there – the proto-rocky planet within the much more massive gas cocoon. "Once you have a core, it may build up an atmosphere around it," Nayakshin explained. "The atmosphere is dominated by hydrogen, but it is much more chemically-rich than the primordial dust material." The more massive the rocky core, the more massive the atmosphere around it, and it grows with time. Given time, such a mix would result in a giant gas planet with a solid core inside, for example, a super-Jupiter. However, the surrounding disk pushes the planet in, closer to the star, and there the outer layers of the gas envelope start to be disrupted and actually consumed by the star. Building on this theory, Nayakshin determined that Super-Earths and other terrestrial planets could, in fact, be the cores of more massive proto-planets that did not have time to mature and were instead robbed of most of their gas by their parent stars. Rocky cores and close atmospheres could survive this disruption process because they are much denser. His paper describing this mechanism appeared in the August edition of the Monthly Notices of the Royal Astronomical Society. "The remaining core is pretty much a rocky planet, with a mass anywhere from almost zero to ten or so Earth masses," Nayakshin said. This means the resulting planet could wind up close to their parent star — or farther away, in the area known to astronomers as the habitable zone. Differing from star to star, the habitable zone is the area where water can exist as a liquid on the surface of a rocky world. Planets orbiting within this range are considered the most likely to host life. In this respect, Aaron Boley of the University of Florida says that if planets do form as described by the tidal disruption theory, then planets may be able to form in systems that are unfavorable to the core accretion mechanism, such as in disks with little dust. Although he did not work with Nayakshin, he explored a similar theory early last year. "I like to think of the mechanisms as opposites," he said. "One is bottom up — core accretion — and the other is top down — tidal disruption." Boley, who has done extensive research on the formation of gas giant planets and the evolution of planet-forming disks, believes that tidal disruption makes it more likely for life to evolve in a wider variety of stellar systems. "It is another way Nature can make planets," Boley said. And more planets mean more chances at life. In last year's paper, Nayakshin expressed the idea that tidal downsizing capitalized on the best of the core accretion model and competing (though more often challenged) model of gravitational instability, while neutralizing the problems in both. Gravitational instability allows for the rapid creation of planetesimals at a distance from the star, but it doesn't allow them to migrate inward. As such, it can't account for many of the closer planets seen today. "Tidal downsizing and core accretion are both mechanisms that can form a wide range of planets," Boley said. "They occur during different stages of a proto-planetary disk's lifetime, and are not mutually exclusive." Core accretion has a difficult time forming planets in more distant orbits over a long period of time. Gravitational instability quickly forms them farther out, where they remain unless they can migrate inward. Tidal downsizing requires that they migrate inward fast enough to have their envelopes removed by tides from their star. Nayakshin noted that the models contain similar physical steps, but in different proportions. "In this sense, the final model is likely to be a composite." Boley expressed interest in watching the new theory develop, and seeing how well it stood against up to the more popular model of core accretion. "Progress is made in science by taking testable ideas and trying to use them until they are proved wrong," he said.